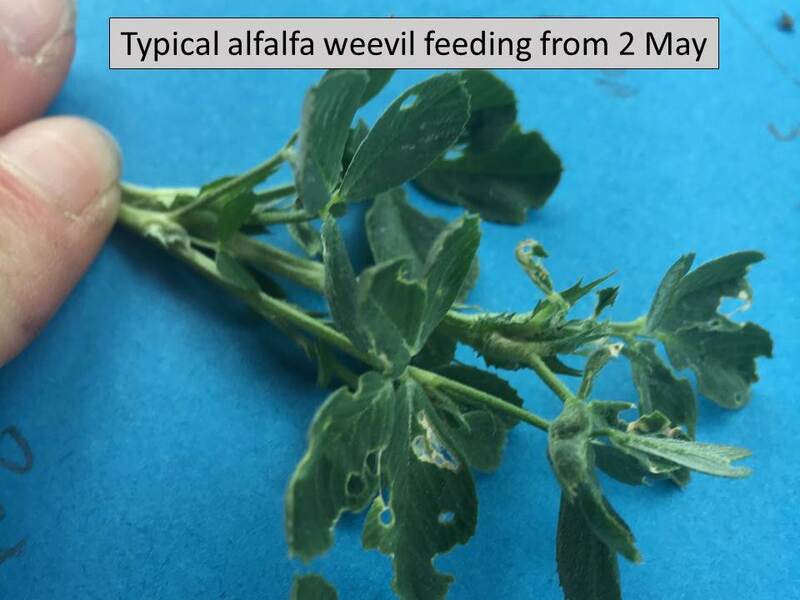 Alfalfa weevil populations seem to have “exploded” around north central Kansas in the past week. 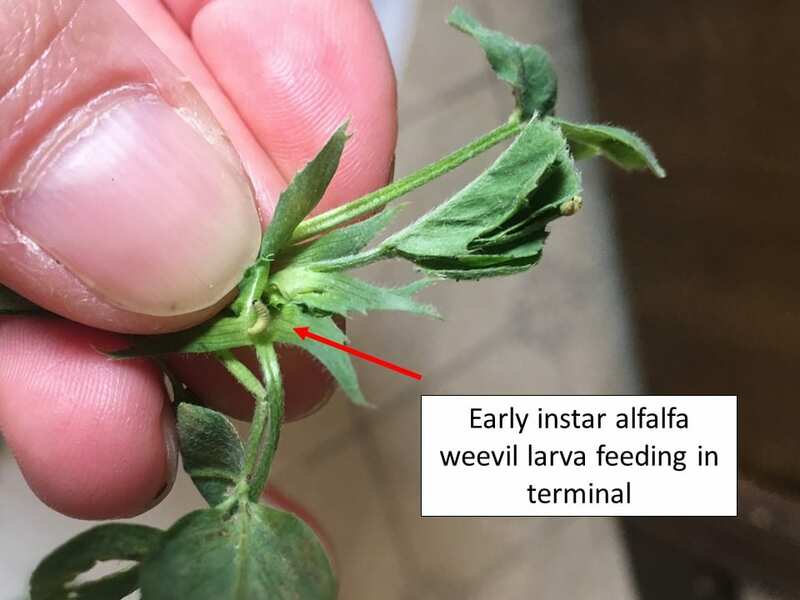 Tiny alfalfa weevil larvae were first detected in NC KS on 5 April, but probably a few started hatching a day or two prior. 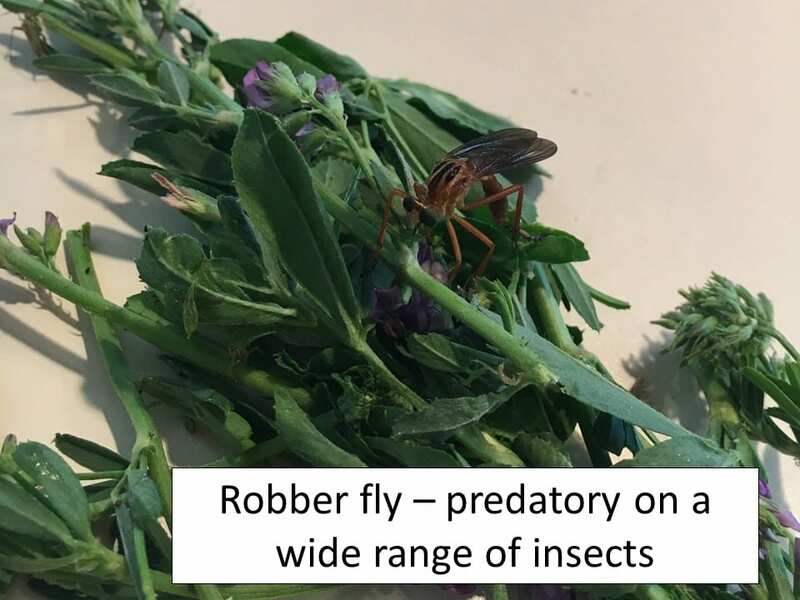 However, the infestation levels that were detected on 5 and 6 April were all well below 10%, and mostly less than 1%. 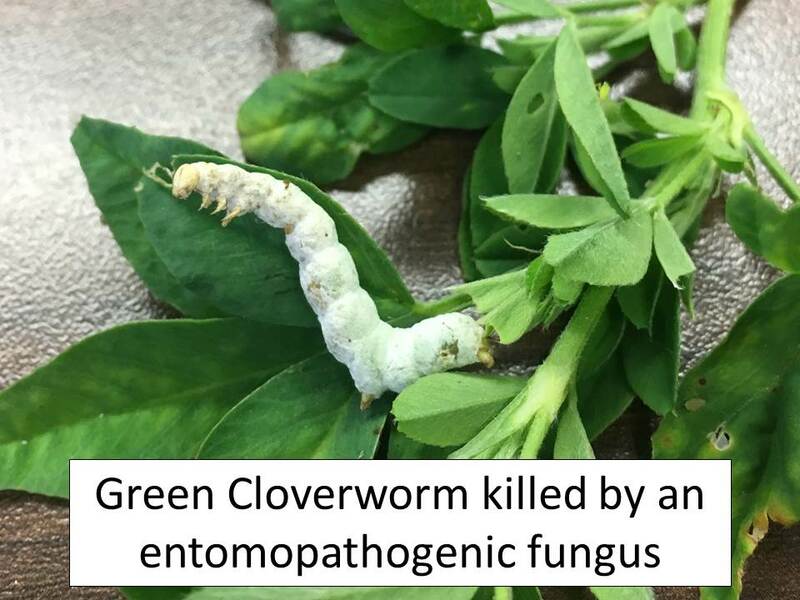 In contrast, fields sampled on 16 April all greatly exceeded 100% infested using the stem shake bucket method and large numbers of different stages of larvae were detected. To sample using the shake bucket method, randomly select individual alfalfa stems and quickly and vigorously shake them into a small white bucket. Then, count the number of dislodged larvae in the bucket and divide by the number of stems to get the infestation level. 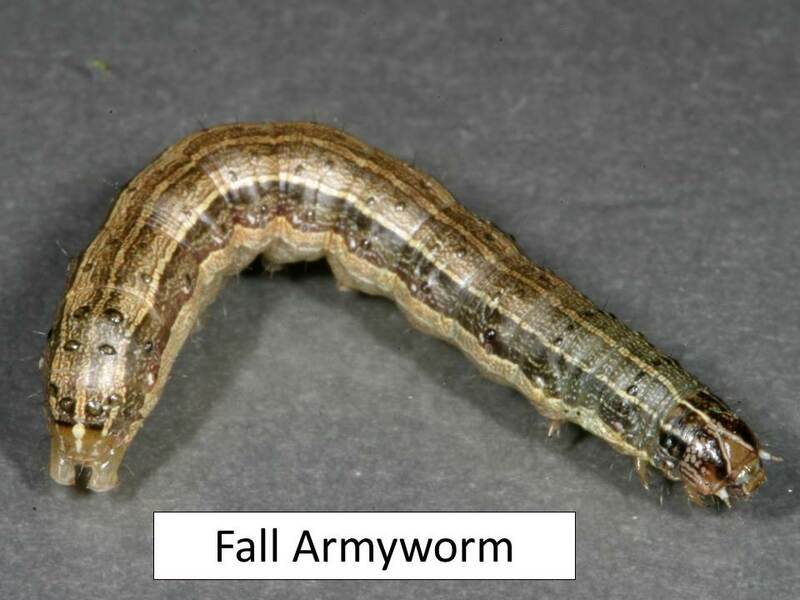 For example, 15 larvae from 10 stems = an average of 1.5 larvae/stem. 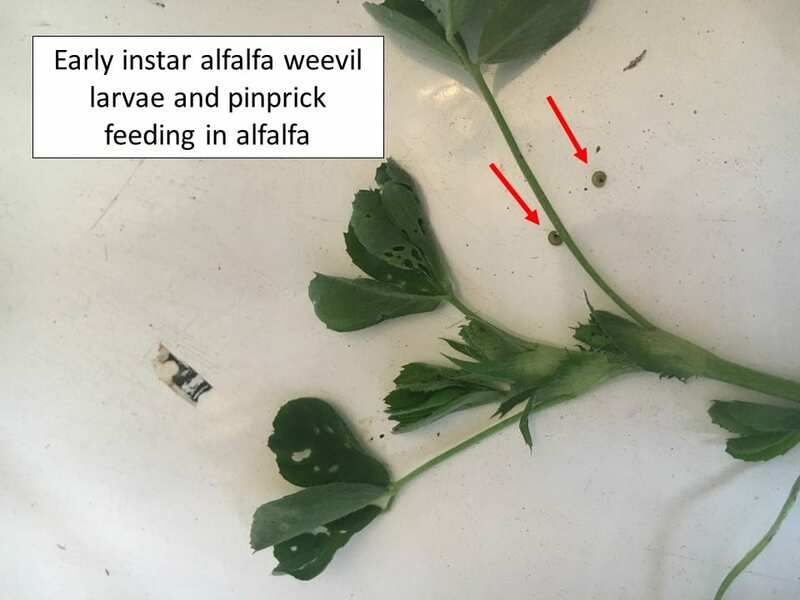 Do this in several areas throughout each field to get a good indication of the alfalfa weevil infestation level and the stage of development of the weevil. One of the problems with the shake bucket method is that some stems have several larvae/stem while others have none (yet). Thus, the infestation level may appear to be higher than is the actual infestation. 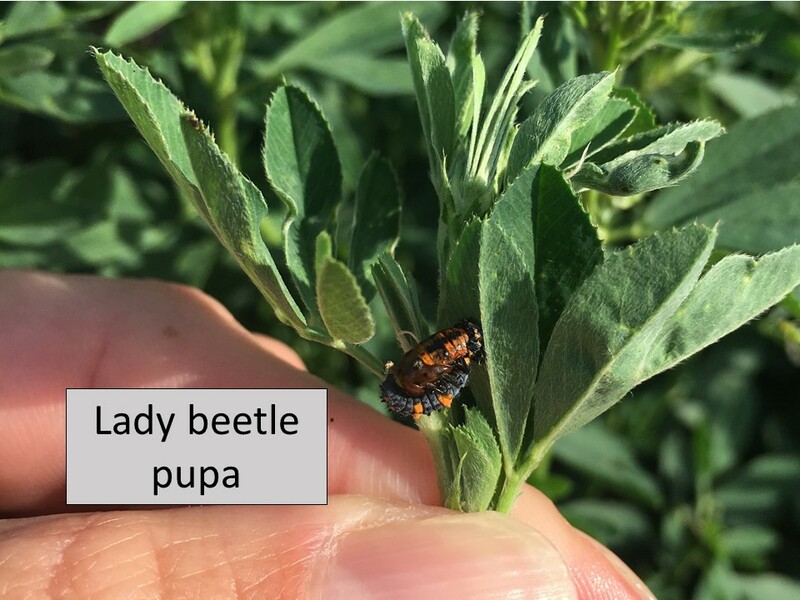 However, in NC KS, with as many larvae as there are already (with more to come probably) and as much damage as we are starting to see in spots, it may be prudent to treat fields as soon as possible. 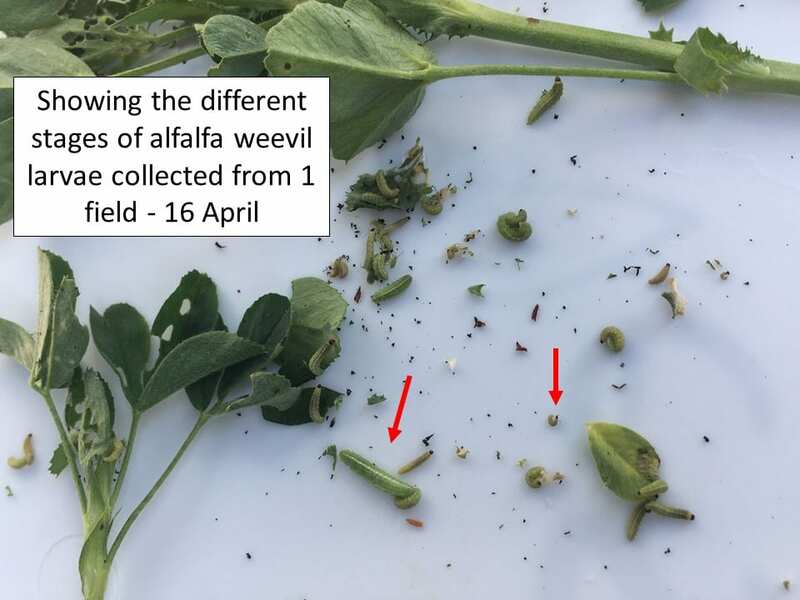 Very small alfalfa weevil larvae were 1st detected on 5 April, 2019 in north central Kansas. Every field sampled had at least one newly hatched larva. There were not enough to sample for a treatment threshold as they are just hatching. 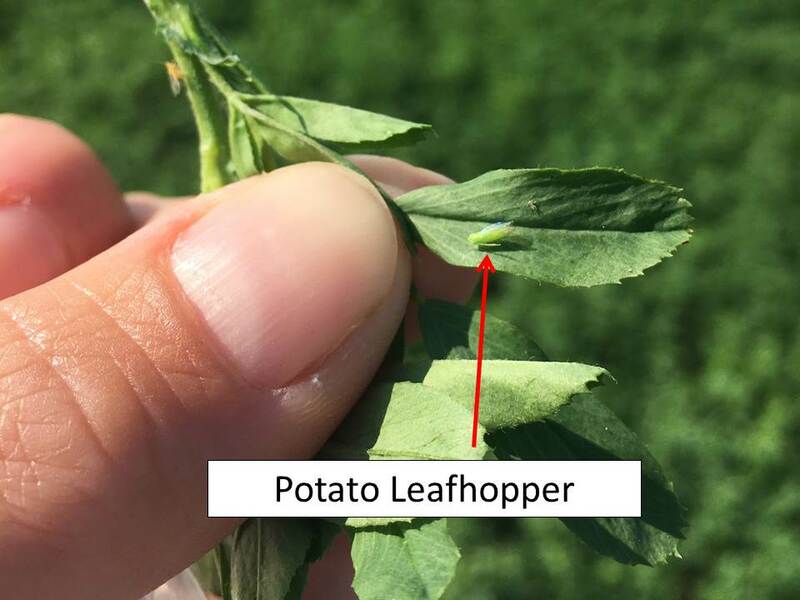 The 1st indication of these small larvae are visible, but very tiny, pinholes in leaves, or a little chewing on plant terminals. These tiny larvae are quite difficult to dislodge from their feeding sites when they are this small. Thus, sampling at this early stage to determine an infestation level is not practical using the bucket-shake method or a sweep net. 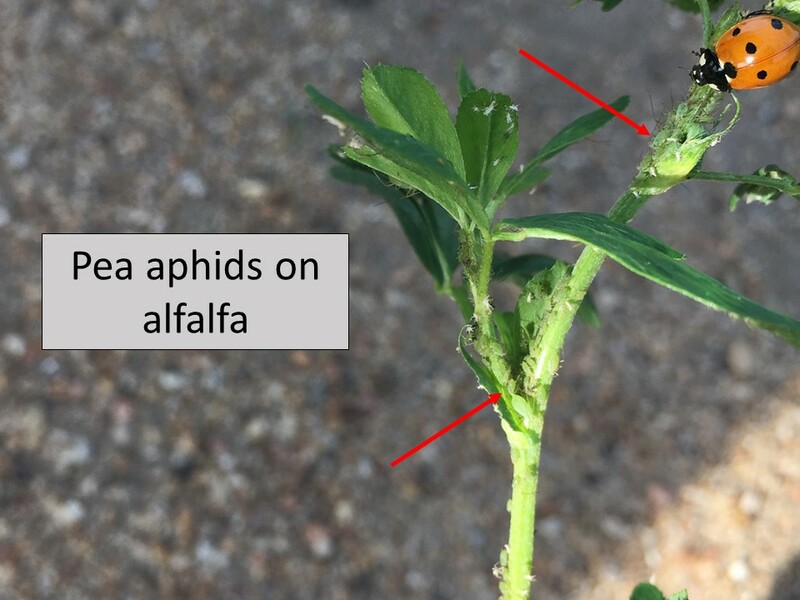 Several alfalfa fields were sampled in north central Kansas this past week. 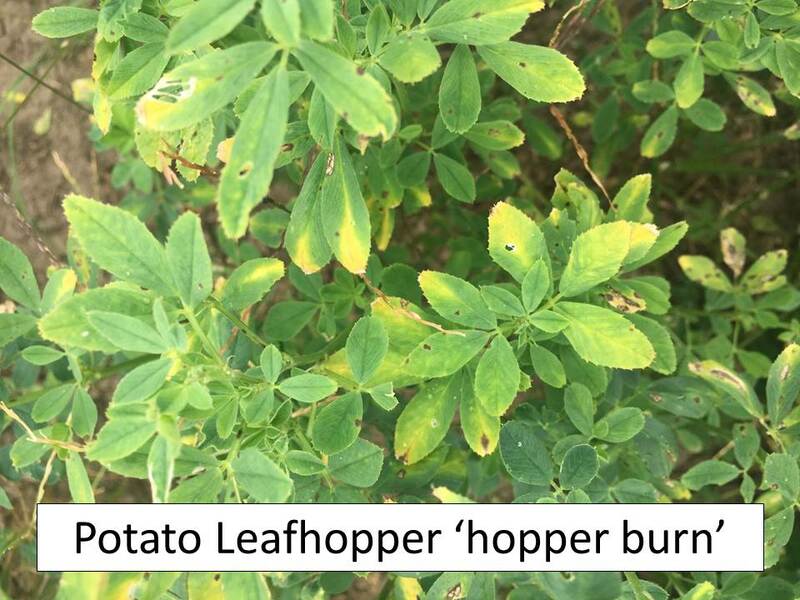 The alfalfa canopy remains an excellent habitat for many insects, especially those fields not treated for alfalfa weevils this year. Many of these insects are beneficial. 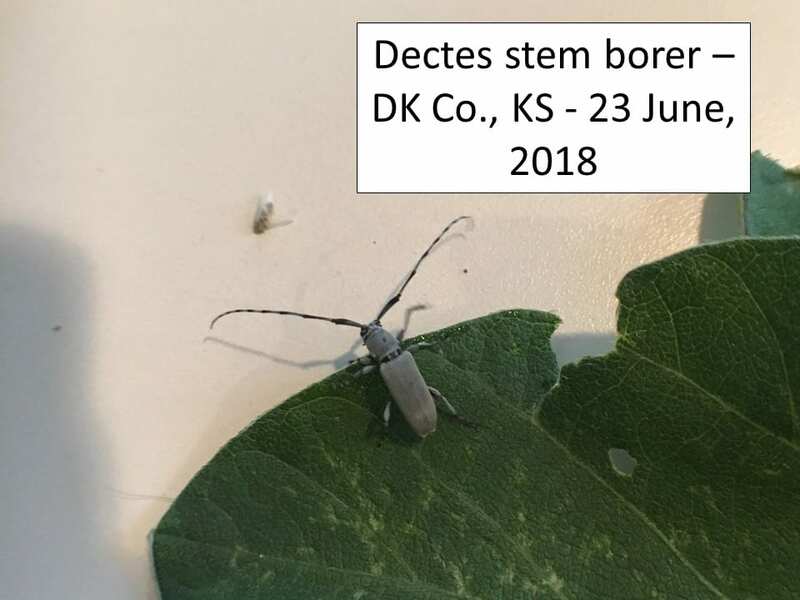 The first adult Dectes stem borer was detected on 23 June, from north central Kansas (specifically, DK Co.). These beetles traditionally spend approximately 7-14 days congregating or aggregating around the borders of stubble fields near where they overwintered. Then, they disperse throughout soybean and sunflower fields and begin depositing eggs in plants of either crop. Several more have been collected since the 23rd. 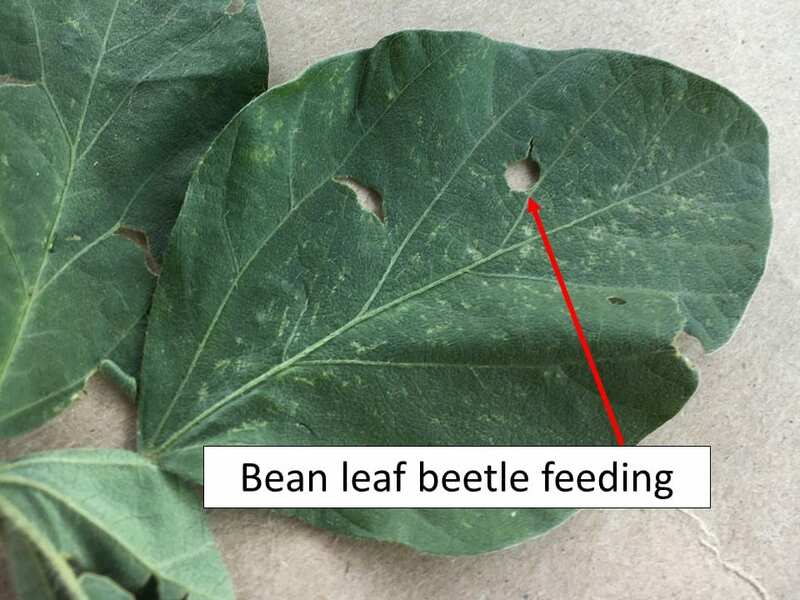 Bean leaf beetle adults have been and will continue chewing characteristic round or oblong holes in soybean leaves. However, at least around north central Kansas, populations seem reduced from recent years. 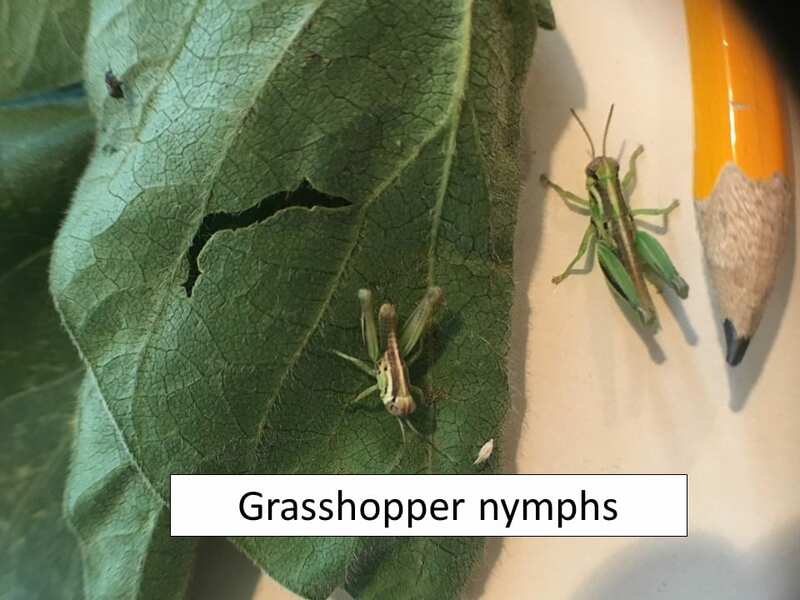 So far, other than a few small grasshopper nymphs, there seem to be less defoliators than usual in either alfalfa or soybeans. However, there is still time left for significant populations to develop. 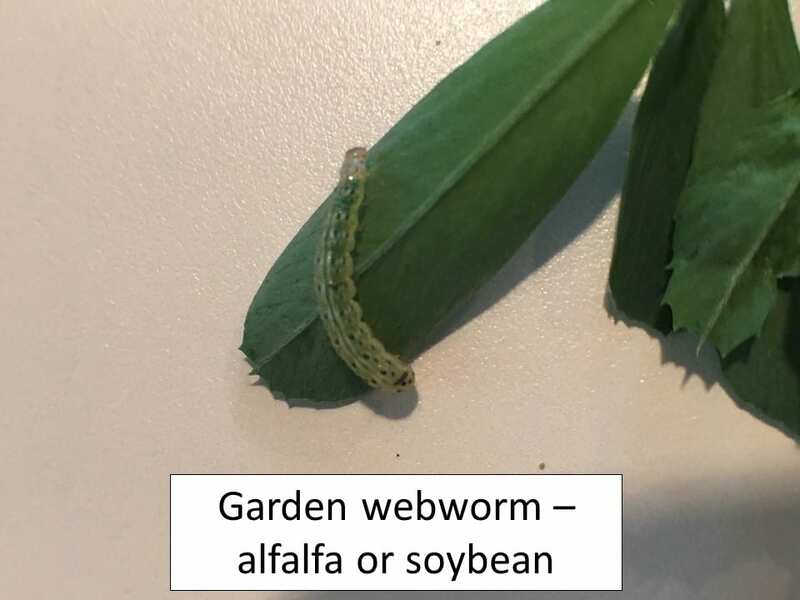 A few garden webworms and yellowstriped armyworms were collected from a couple of fields and many of the soybeans are still very small, in the 3-5 trifoliate stage. 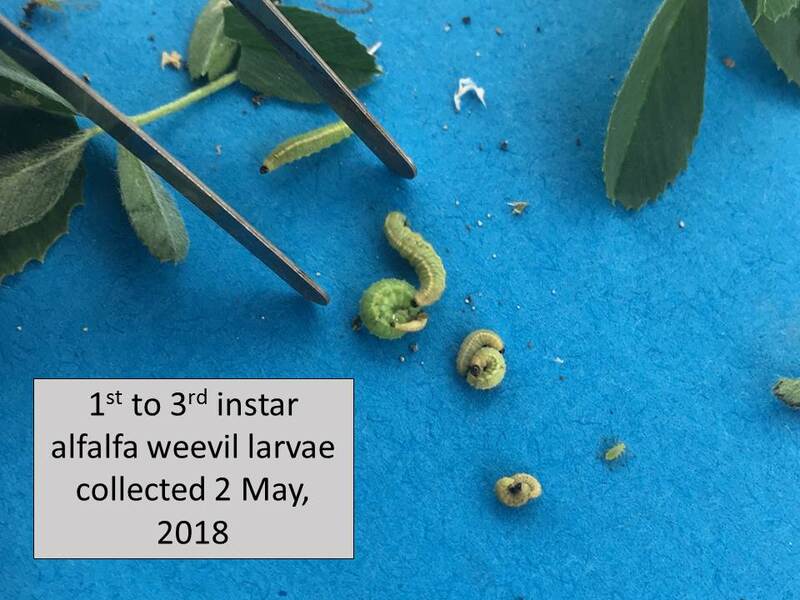 Alfalfa weevils sampled this week were in all stages of larval development, although no pupae or adults were noted in any fields. 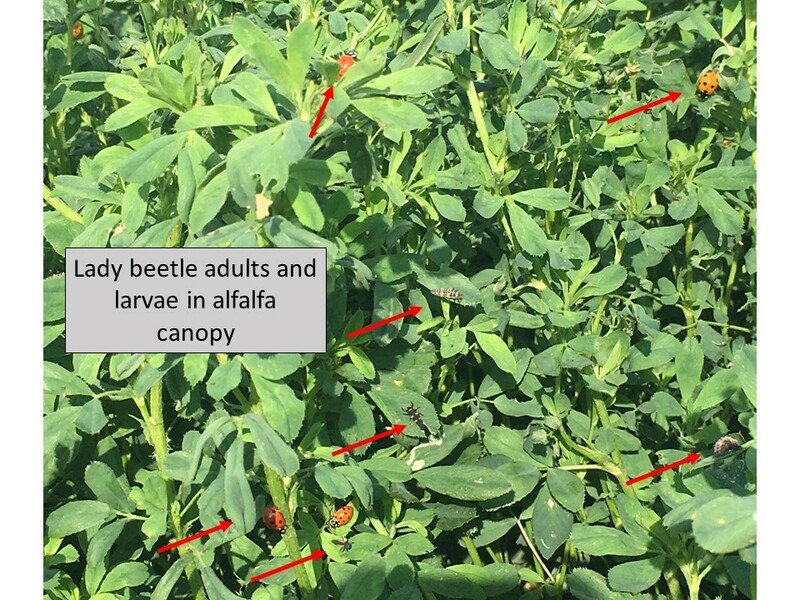 Actually, no adult alfalfa weevils have been detected yet this year. Also, there is relatively little defoliation, at least so far, in north central Kansas. 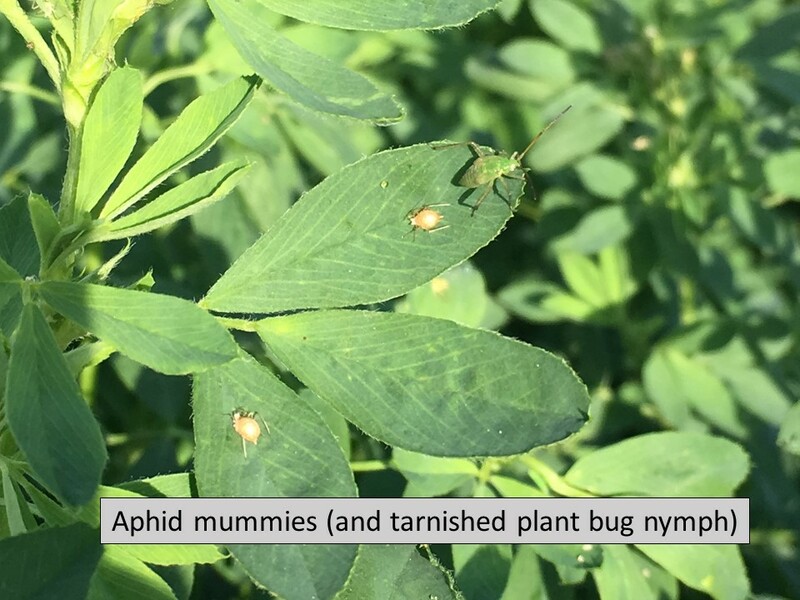 No infestation levels exceeded 20% this week and most alfalfa is 10 – 16 inches tall and should grow better after recent rains. 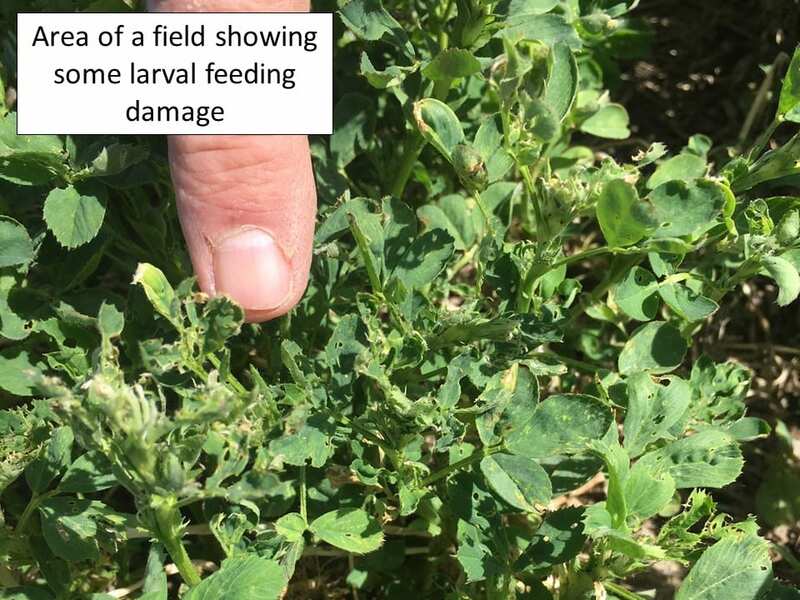 Alfalfa weevil infestation levels in north central Kansas have not been this low, overall, for many, many years! Alfalfa fields sampled this week in north central Kansas had not really changed a great deal with stems anywhere from 2.5 to 9.5 inches tall. Sampling the taller stems (8 – 9.5”) resulted in a composite infestation of 10%. 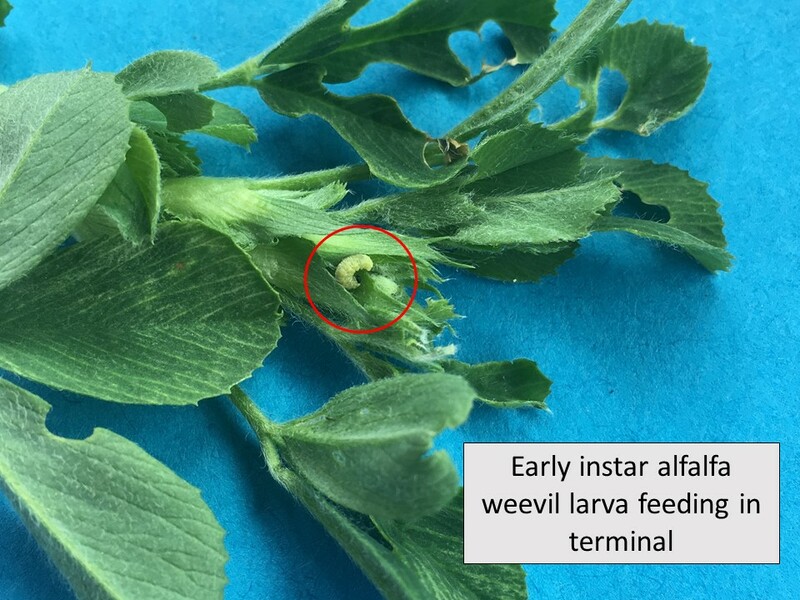 Sampling only the smaller stems (2.5 – 4.5”) resulted in a composite infestation of 27%. The lowest overall infestation level detected from any field was 10% and the highest infestation level was 30%. 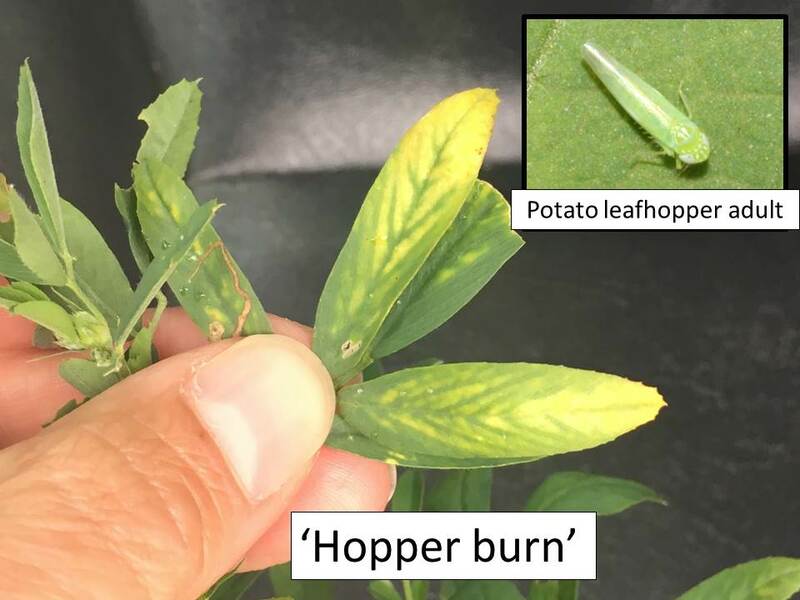 Smaller stems had smaller larvae with no, or very little damage or defoliation, while larger stems often had evidence of feeding, but no larvae. Thus, it seems the earlier hatching larvae may have been killed by the recent cold weather, or at least populations were reduced. However, we did find 3rd instar larvae and even a pupa. There are also quite a few small 1st instar larvae. This probably means eggs are still hatching with more larvae to come, so at least 1 more week of monitoring would be prudent. 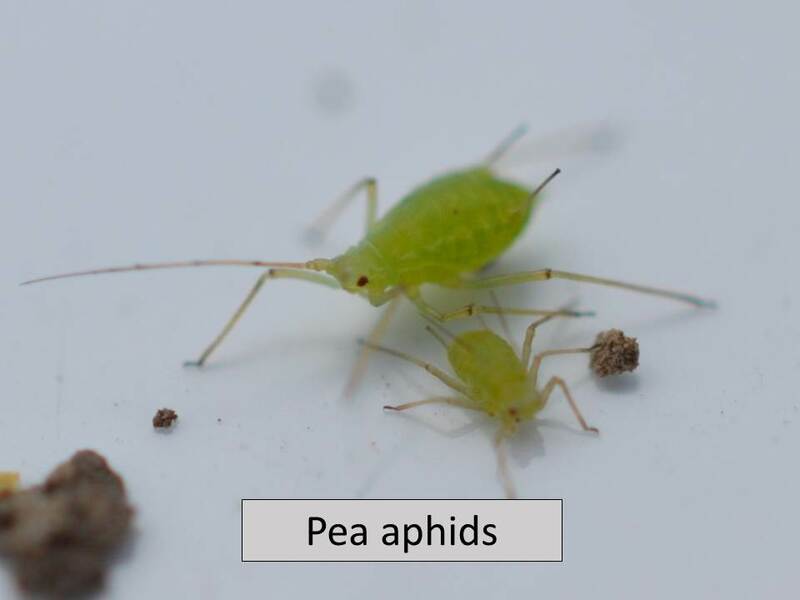 Pea aphids are still present in all alfalfa fields sampled but not yet in numbers to be concerned about. 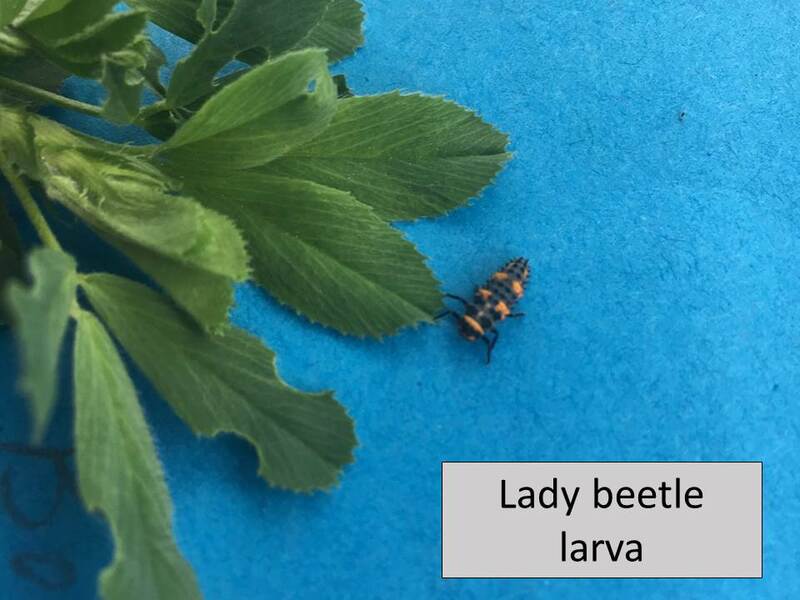 However, there were no beneficials, (lady beetles, lacewings, or parasitic wasps) noted either. 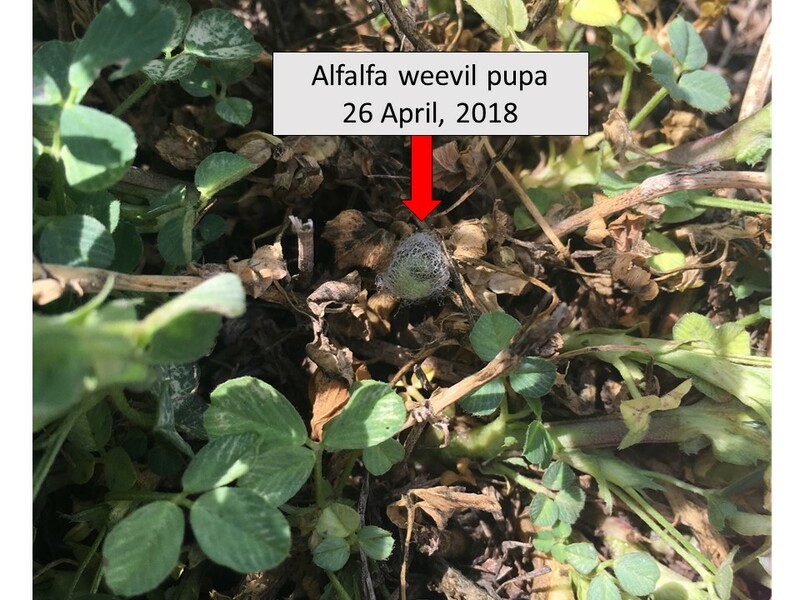 Alfalfa fields were again sampled 18 April, after the latest bout of sub-freezing temperatures. 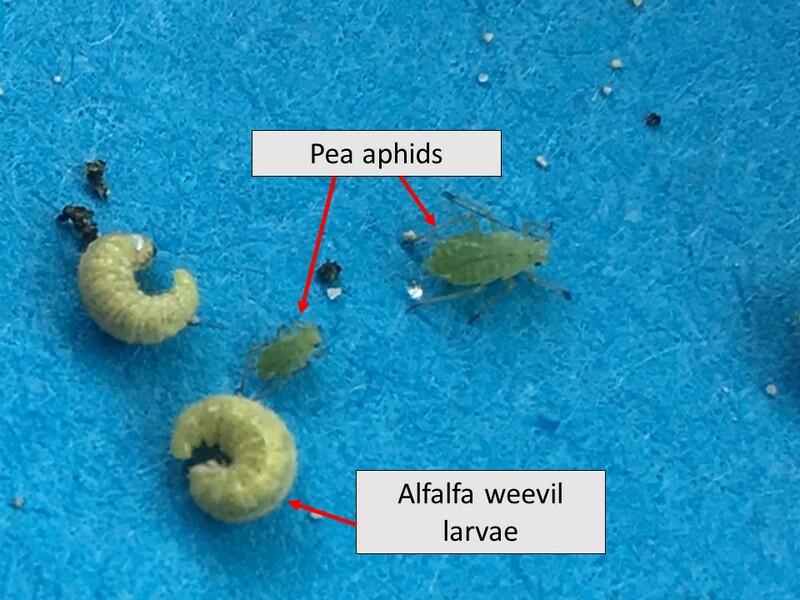 Alfalfa weevil larval development does not seem to have progressed much since fields were sampled last week. 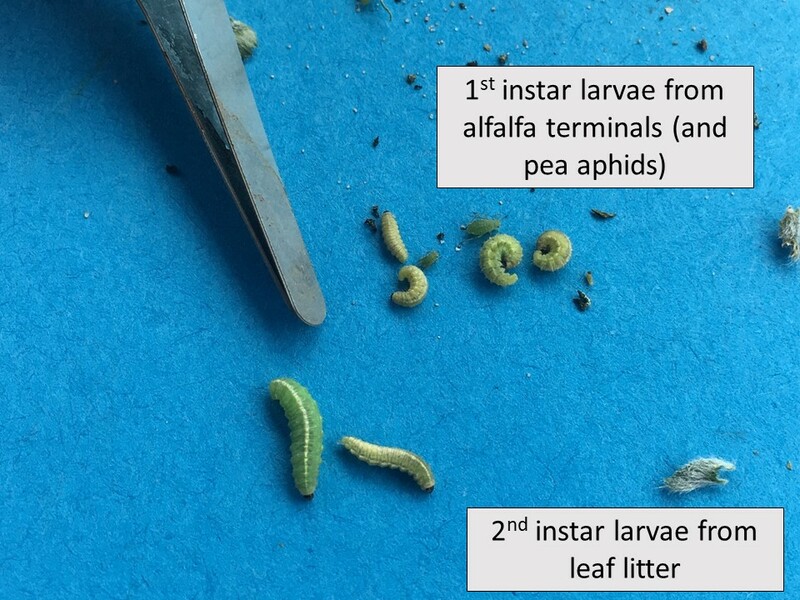 All larvae that were collected from plant terminals were still small, 1st instar larvae. 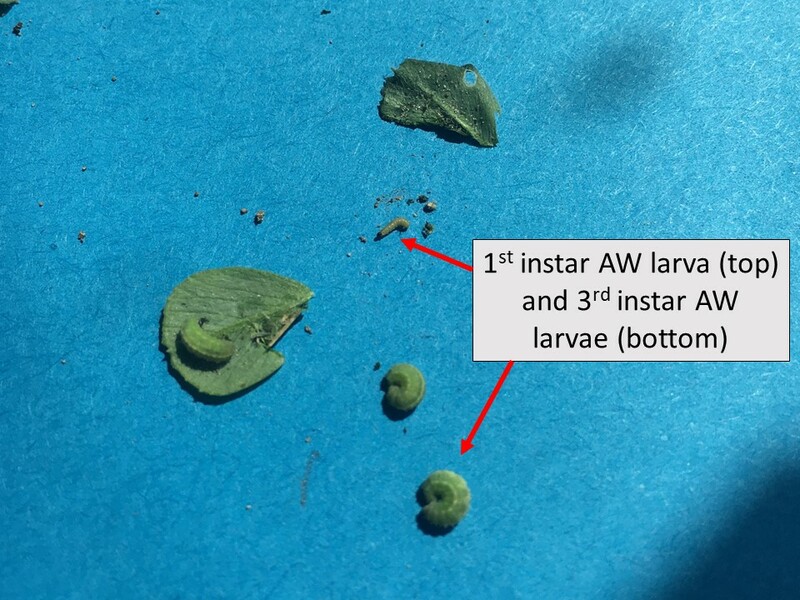 Like the last two week’s samples, there were live 1st instar larvae feeding beside dead larvae. 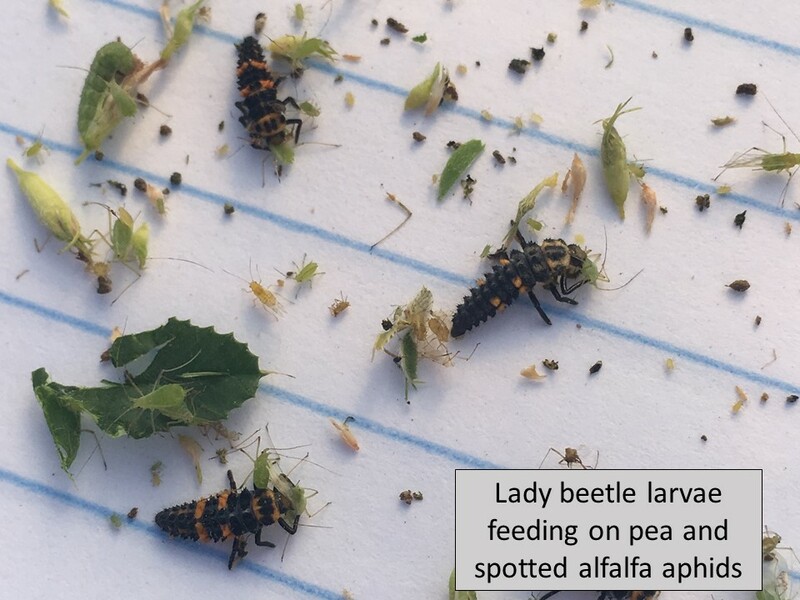 However, a few larger, 2nd instar larvae were found in the leaf litter under the alfalfa canopy. Infestation levels varied considerably depending on location. Open fields with exposure to wind had infestations ranging from 0% (no live larvae found) to a maximum of 10%. 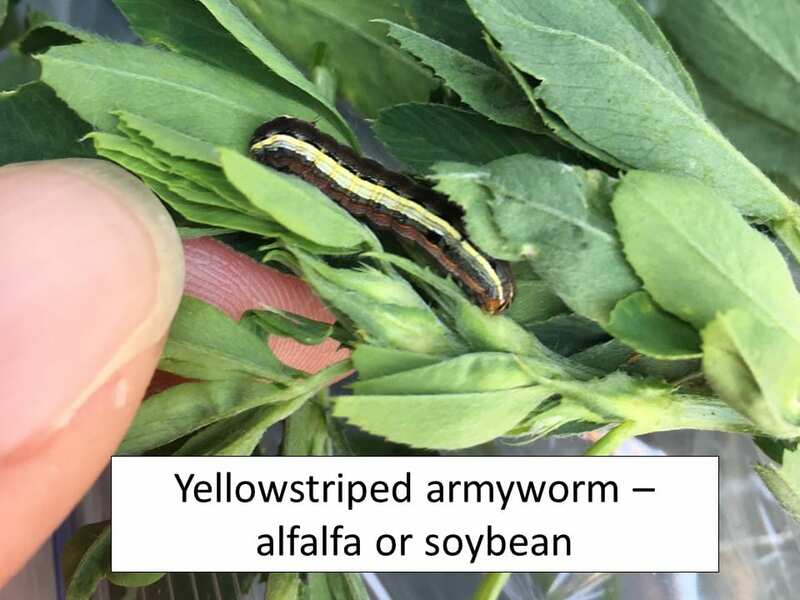 However, one small alfalfa field that was bordered on the north by a windrow had a 35% infestation of live, feeding larvae. 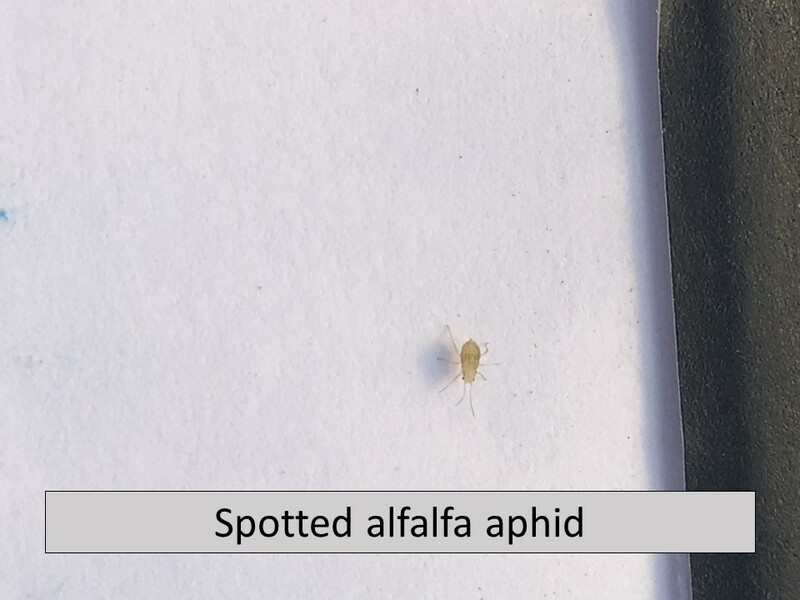 Pea aphids were also detected in every alfalfa field sampled. Some were already producing nymphs. 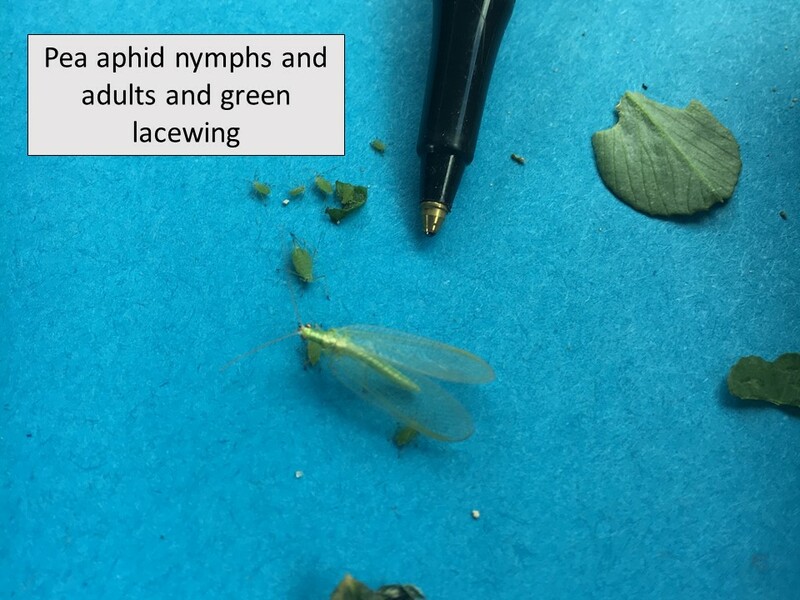 Unlike last week, no lady beetles or mummified aphids were noted, but an adult green lacewing was collected from the alfalfa canopy.